Comments: Mandatory reading for any fan of manga or anime. 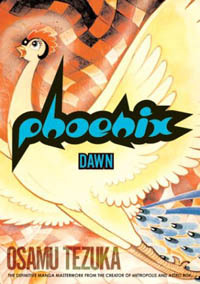 Part of a thirteen part series of manga, Phoenix: Dawn takes its readers all the way to the origins of the Japanese culture, back in the day of Queen Himiko. Set somewhere between 240 and 270 A.D., Dawn foreshadows the events of Phoenix: A Tale of the Future (released and reviewed last year, also by Viz) as mankind continues to wage pointless wars based solely on the vanity and poor judgment of a leader who has far too much power. In this volume -- marked volume one even though it was released after Future, domestically -- the story follows the life of Nagi, a young boy living on the volcanic island that is also home to the Phoenix. The legend of the Phoenix -- an immortal bird with blood that can grant eternal life -- can be found all over the world, thus why Dr. Tezuka chose it as the unifying factor for his series. When Nagi's sister Hinaku grows ill, her husband has little choice but to hunt for the Phoenix so that he may kill it and give her a chance to live. However, he dies in the process, leaving her illness to take its course. But then, a strange man arrives at their island with knowledge of medicine, and to save his own life he offers his services as a doctor. I don't want to ruin the plot, for it's rather complex and most of the fun of reading this story is its lack of predictability. I will say that eventually word gets out that the Phoenix is truly on Nagi's island, and when the aging Queen Himiko hears of this, it will take more than the simple islanders to keep her from searching for the ever-living bird. This is an exquisite tale originally written in 1967. It looks cartoonish, but the subject matter contained within is as pivotal to the survival of the human race as other works of classic literature. More than a simple historical adventure, Dawn is a reminder of the past, a reflection of the present, and a warning of times to come. It is easy to see how Dr. Tezuka inspired an entire generation of people to imitate his style, and I'm not quite sure anyone has matched his skill yet. The artwork, while dated, in no way hinders the excellence of the story. Despite its deceptively simple appearance, Dr. Tezuka actually employs groundbreaking angles for his scenes that still keep the eyes flowing from panel to panel. The text appears typographically sound, and the price is rather good considering the thickness of the manga. This volume is the standard size of most of Viz's releases, which is a slight disappointment after the oversized release of Future. Yet, I suppose an oversized book must come along with an oversized price. If a smaller size helps convince more people to purchase this, then I wish Viz the best of luck in getting this to the largest possible audience. If this were printed from right to left, then Dawn would be perfect. This is what manga is all about, what every other manga strives to be. What's amazing about this book is that while it would be a masterpiece for any artist or writer, it's a fraction of what Dr. Tezuka has graced us with. I can't wait to get my hands on a translation of the next 11 volumes. Most of the manga I read are more entertaining than enlightening. Most of them are comics, bound in book form. This is a graphic novel, in the truest sense of the word. I can't recommend this title enough to fans of manga, of literature, of humanity. I realize that I've done nothing but praise this book, and you may doubt that it's as good as I say it is, but trust me when I say words cannot describe how great this is. Read this volume and I promise you'll want to read the other twelve as much as I do.